Day 26 of 30 Days of Creativity - Getting creative with breakfast. 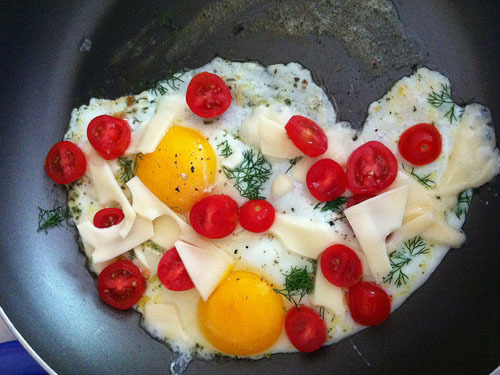 I threw together eggs, dill, seasalt, pepper, grape tomatoes, swiss cheese and dill. I think I will call it ljc's summer skillet eggs. I am totally going to eat this for dinner this week! (Mostly because I could never get up early enough to make it for breakfast. :) ) Thanks for the delicious idea!